We manufacture stator coils for machines up to 7000 volts and with coil lengths up to 90". 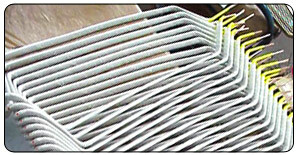 Stator coil insulation assemblies include Dipped & Baked and VPI types, as well as more detailed customer specified systems. Typical lead times are 3-4 days, with emergency 24 hour service available also. 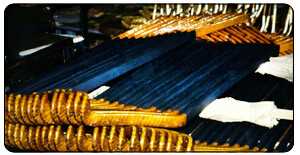 One set orders as well as production volumes are equally welcomed and efficiently processed. 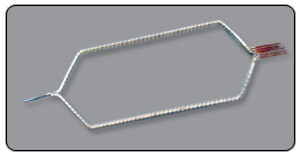 Overall Coil Length 10" to 75"
Maximum Coil Cross Section 0.750" x 2.50"
Insulated with materials designed for this process, typically mica, kapton, and or glass tapes or sheet materials. Dipped in Class F or H polyester resin and baked to cure. Coils are fully cured and require no further processing to achieve optimal physical and electrical properties. A very forgiving insulation system which is suitable for most AC & DC industrial machinery. Insulated with materials designed for this process, typically low binder mica, nomex, and or glass tapes. 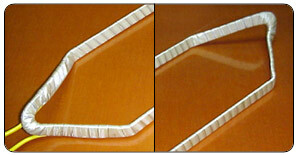 Typically, sheet materials are not used in order to facilitate penetration of the VPI resin. Coils are supplied dry, uncured and require post-insertion vacuum pressure impregnation (VPI) processing in order to schieve maximum physical and electrical properties. Well suited for harsher environments. Improved moisture resistance, heat transfer, and contamination resistance when impregnated with the proper resin system. If you would like more information on stator coil products please call 1-800-792-6457 or click here to contact us.